Gibson Les Paul 1956 Reissue Custom Shop - Abilene, limited run. Manufactured 30th November 2017, brand new, un-played, still in a box. The Gibson Les Paul Model as it stood in 1956 is a pure rock'n'roll legend, represented in greater detail than ever before in the 1956 Les Paul Reissue. This was not quite where the Les Paul had begun, and not quite where it was going, but a powerful stop along that road that carried plenty of important features that have made this mid-'50s marvel a beloved tone machine to this very day. The guitar still retained its fat, snarling P-90 pickups and a rounded '50s neck profile that not only feels superb in the hand, but also transmits added string vibration from neck to body to enhance resonance. One of the most significant changes to the Les Paul Model of 1956, though, was the addition of the new Tune-o-matic bridge and stopbar tailpiece—which debuted on the Les Paul Custom two years before—replacing the trapeze and wraparound tailpieces that had adorned earlier versions. 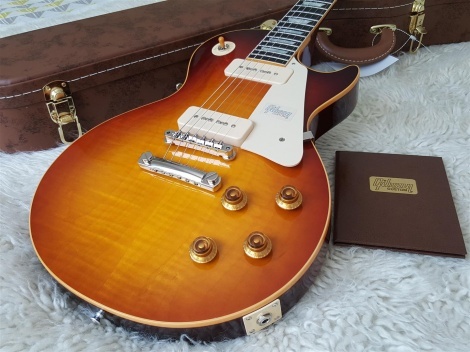 The sonic powerhouse of the 1956 Les Paul Reissue remains its two fat single-coil P-90 pickups, beloved since the 1940s for their aggressive midrange, solid low end, and sparkling, silky highs—with that ever so slightly gritty edge for added cutting power. Gibson makes its P-90s today just like it did a full 60 years ago, with two Alnico V bar magnets in each pickup and coils wound with approximately 10,000 turns of 42 AWG wire, for plenty of beef when you hit 'em hard, but crystalline clean tones when you back off the guitar's volume controls. Bumble Bee tone caps assist in that warm, singing "woman tone" when you roll back the tone controls, too. To top it all off, the 1956 Les Paul Reissue plays superbly right out of its Custom Shop hardshell case thanks to a trip through one of Gibson's state-of-the-art Plek machines before it leaves the Custom Shop floor.